The US government holds vast tracks of public lands—more than a 654 million acres, in fact—for public use such as national parks as well as for military use like test ranges and proving grounds. But most of the time, much of that land is left to rot when it could be producing clean solar energy for our ever-increasing power needs. To that end, President Obama signed the Solar Energy Zone initiative into law last October in an attempt to bring much of this fallow land under a single federal management entity and streamline the approval process for converting unused government real estate into utility-scale solar projects. Each Solar Zone is ranked based on its solar potential, environmental impact, and available transmission lines. So far, 17 such SEZs have been established throughout 285,000 acres of the American West in Arizona, California, Colorado, Nevada, New Mexico and Utah. Granted that's out of a potentially available 17 million acres but hey, it's a start at least. And, if fully built out, these 17 areas will generate 31,658 MW of solar energy—enough to power 7 million American homes. California's largest SEZ, Riverside East, is spread over 147,910 acres of Southern California and has the potential to generate up to 16,434 MW alone. To do so, the BrightSource and Abengoa energy companies have teamed up to develop and operate the 500 MW Palen Solar Electric Generating System, the world's tallest concentrating solar power system, on 3,800 of those acres. Concentrating solar systems work by reflecting and, well, concentrating, the sun's rays using a series of mirrors (or heliostats) onto a very small target area to heat a boiler, which produces steam to drive an electricity-generating turbine. 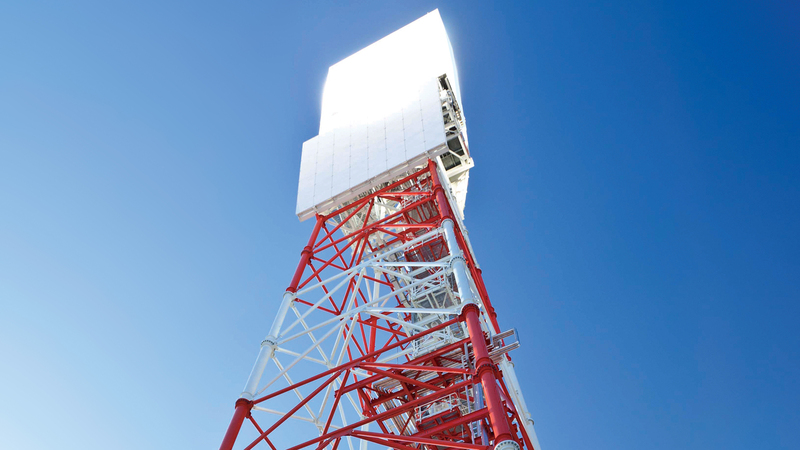 What sets the Palen project apart from other solar concentrators is the height of each 250MW boiler—they're each 750 feet-tall. That's 240 feet taller than the current record holder, the 540-foot concentrator at Crescent Dunes Solar Energy Power Plant. This is done to increase the density of heliostats beneath them while reducing the total footprint of the system by as much as 33 percent. What's more, each heliostat is mounted on a pole rather than a concrete pad, which reduces upkeep costs, doesn't require the land be perfectly level before installation, and preserves more of the local flora. If that wasn't enough, the Palen system will utilize dry-cooling technology, which saves up to 50-percent of the water expended by liquid-cooled concentrators. The necessary permits have already been filed for the project, construction is expected to begin by the end of this year, and enough electricity to power 200,000 California homes should be flowing by 2016.